Falvey Memorial Library :: Finals Can Get Ugly … So Get Help! Finals Can Get Ugly … So Get Help! 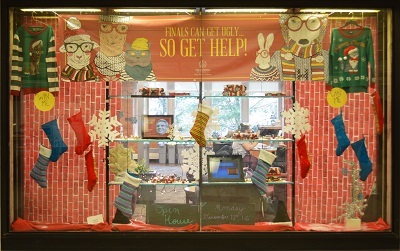 “Finals Can Get Ugly … So Get Help!” is the title of the current window display in Falvey. Playing with the ugly Christmas sweater theme, cartoon animals wearing glasses, hats and mufflers are in the top center and flanked by two “ugly Christmas sweaters” featuring cats (after all, we are Wildcats); on the sweaters are tags advertising “Win me.” The window is filled with large snowflakes, small Christmas trees, Christmas stockings and two digital picture frames. Eye-catching as it is, the motive behind the exhibit is to inform students: where to get help from the subject librarians who are featured in the digital picture frame on the left and to advertise the Library’s stress-busting open house on Monday, Dec. 12, 1-6 pm in the Holy Grounds 24 hour lounge. Free coffee, hot chocolate and pretzels and activities such as board and electronic games will be available to students on Dec. 12, 1-6 pm. Students will have opportunities to take Polaroid photos of themselves in a large two-person Christmas sweater. They may also enter the drawing to win one of the “ugly Christmas sweaters” featured in the exhibit; one lucky female and one lucky male student will receive a sweater. Take a break from studying and join us, enjoy a pretzel and hot beverage and play a game with your fellow students.